Storm Prediction Center ..SUMMARY... Widespread severe wind gusts are forecast from the Ozark region to the lower Ohio Valley today. Additionally, very large to giant hail and tornadoes will be possible from the Red River Valley northeastward to the Ozark Plateau. Damaging winds, large hail, and a couple tornadoes will also be possible across the Tennessee Valley, middle Ohio Valley, and portions of the Mid-Atlantic. There is 97 total SPC storm reports for Tuesday 5/23/2017. Farthest west was Texas with two long tracking lines of hail and wind reports. Largest hail was 2 1/2 inch in MCMULLEN, TX. Trees took out power-lines and blocked roads. Some structures were damaged, a school roof partially blown off and a tractor trailer blown over. BEE, TX was hit hard, a grain silo blew down., the Bonnie Plant Farm was damaged. Winds of 81kts were measured there. In trampoline vs power-poles, power-poles won. There was 14 tornado reports. Two were weak land-spouts reported in fields in Illinois. 9 were in Georgia, mostly tree damage and power-lines, some homes damaged. A mobile home was shifted off it's foundation and a tractor trailer was flipped on I-75. In North Carolina 1 injury was reported when a mobile home was overturned in Bareskin Community SAMPSON, NC. The AUTRYVILLE VOLUNTEER FIRE DEPARTMENT was destroyed. TYRRELL, NC had crops flattened. Two barns were damaged in ROBESON, NC. 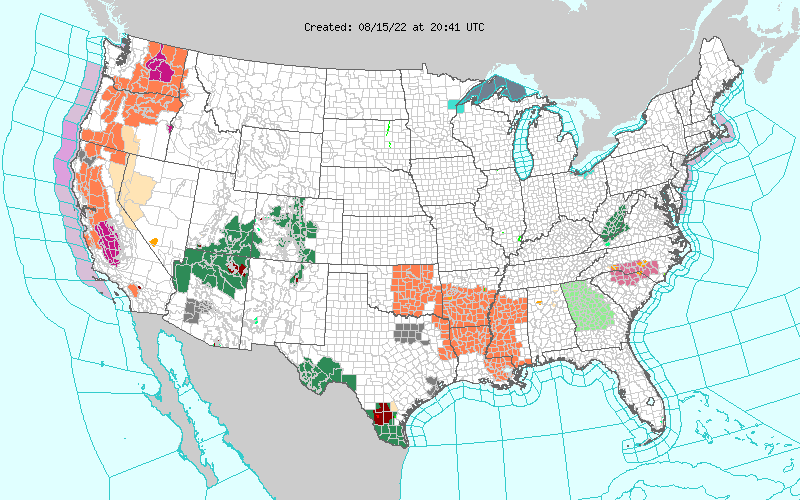 This storm coming to hopefully drench the Southeast has been leaving a trail of storm reports in it's wake. Starting in Mexico, several border towns lost electricity. At the boarder of Texas and Mexico in Loredo, TX up to 70mph winds were reported by spotters Sunday evening. The World Trade Bridge there, one of the busiest commercial border crossing spots into Mexico is expected to be closed due to the storm until next weekend. Some tractor trailers blew over, some port of entry roofs were lost and there was cosmetic damage done to the bridge. The bridge normally handles 15,000 trucks a day making the border crossing. Colombia Solidarity Bridge in Laredo is the closest bridge trucks are being diverted to, other bridges are in Eagle Pass, Pharr and Brownsville. There was one fatality when a 14 year old boy picked up an electrical wire downed by the storm. Trees were knocked down, there was scattered structural damage, including the roof of the Laredo fire station, along a 6 mile wide area of what was later determined to be straight line winds. Wind damage to mostly trees were reported on up into Mississippi. Hail up to 1 1/2" was also reported mostly in Texas. The hail got bigger on Monday as 1 3/4" fell in both Beckham, OK and Chaves, NM. Wind reports came in from Texas to South Carolina. Mostly knocking down trees and power lines. The storm also looks to be a wet one with plenty of flooding evident in the this StormChasingVideo. Flash Flood watches and Warning extend up and down the Mississippi River and also cover a wide swath of the Southeast today. Today's rain and weather should be more confined to Mississippi thru the Carolinas with more extending up from the Mississippi Valley. Tomorrow maybe more scattered across the South and East. Winds of change are blowing strong here from drought, change in season and forces beyond reckoning. Most are finding their way through it, though not the winter garden. The dead snow peas and other winter fare are now mostly buried under a layer of fresh compost. Legumes fix nitrogen to the soil as their remains add it as well. In the dry weather the buried brown matter will help hold moisture. Anything green left the cow or I consumed.. Other losers are the grass, old oaks behind the barn and some of the local wildlife. Change isn't all bad: bitties hatched, sweet potatoes were started, as soon will be okra and watermelon. Turns out it was Busterpony that chewed threw the rope and broke the garden gate to consume the spring carrots. Chances of rain are increasing over the next few days for Eastern Central Florida as are the chances generally for the rest of the state. This moisture could pop in front of a possible Low developing over Louisiana and Southern Mississippi from the tail of the current low traversing the United States. GEOS-5 has it looking like a sloppy landcane Tuesday evening. Moves on North North East from there. 4. Secure an insurance check-up. 6. Check on your neighbor. 7. Complete your written hurricane plan. For the full graphics and more information on competing these steps follow the link above. There was a webinar for the kids and some well done videos released, like this one.. The best part though was the Hurricane Awareness Tour. The Hurricanes Hunters along with some NHC forecasters took to the skies and landed in cites from the Caribbean to the East Coast to gather with local disaster officials, meteorologists and community service entities to get people prepared for the season ahead. I met up with the tour in Orlando, FL. It was a great opportunity to school children, see where all the recon data comes from and hear the stories behind some of the incidents seen in past data.